Summer breeze in the air, long drives into the sunset, open fields, lying on the grass and reading books, long maxi dresses, the golden hour of sunset. 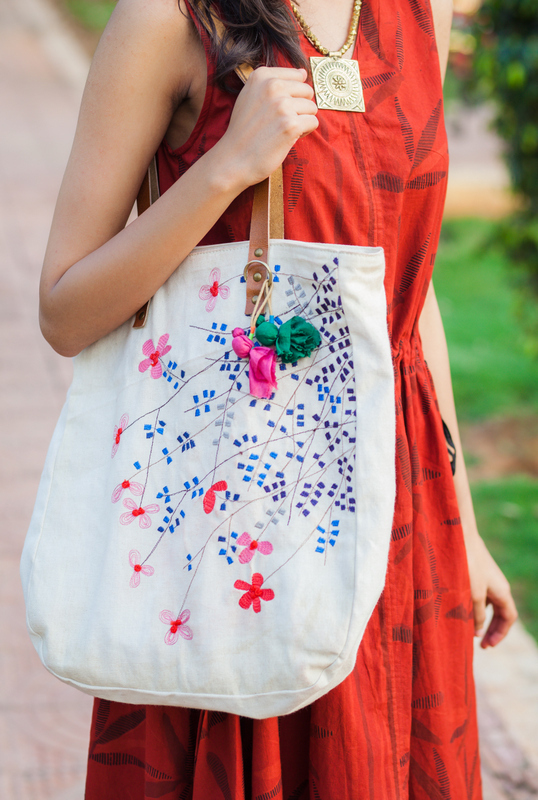 I love clothes that inspire you to come up with themes and Indian August is one such brand that does exactly that. Something about the name Indian August makes me think of summer rains, old rickety swings, getting blown away by the wind while the sky thunders above you – a very bohemian, care free vibe that inspired me to come up with this look. 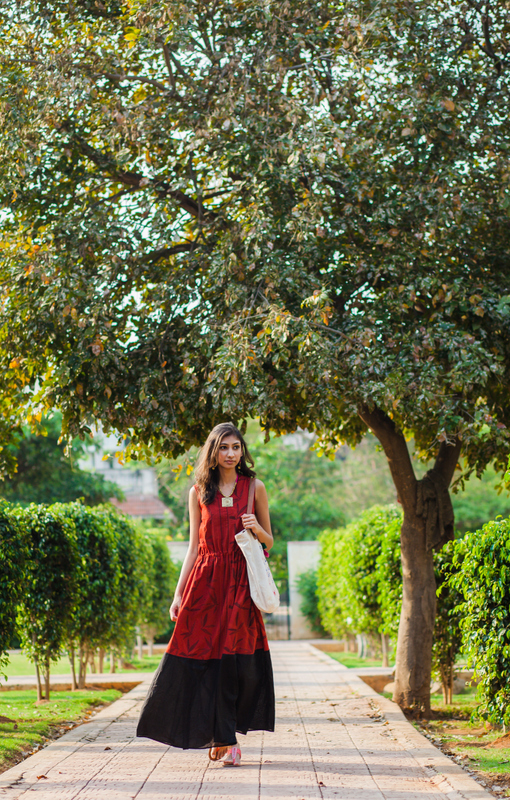 A chance happening brought us to this quaint little park that formed the perfect setting for this shoot. 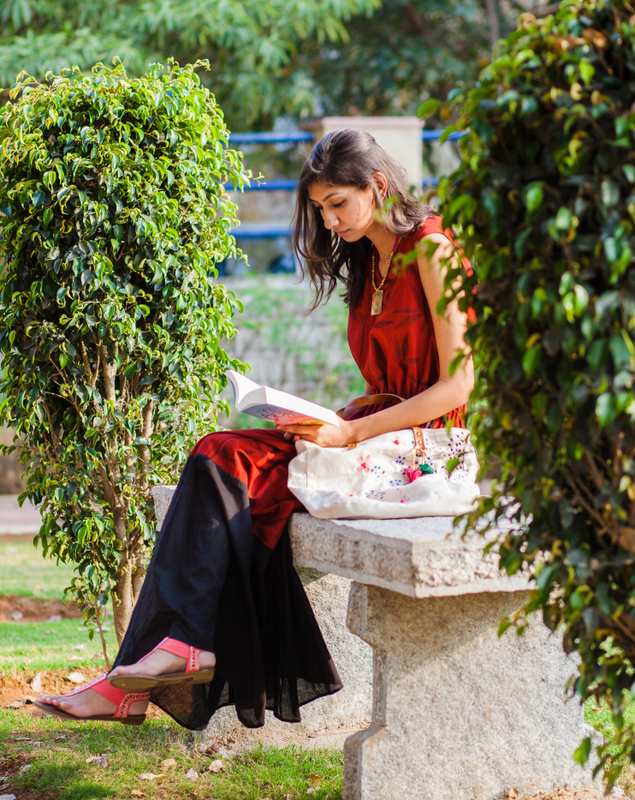 So much so that I think I quite enjoyed just sitting around and becoming engrossed in my book, while my photographer did all the work!Indian August has a range of products that includes clothing and apparel, home textiles and decor. With a focus on Indian contemporary designs, they have under their roof more than 25 designers and master craftsmen who bring to you the most elegant and contemporary designs. The eclectic use of traditional fabrics like chanderi, mangalgiri for Western outfits like ankle length pants and trousers was something right up my alley. The Khadi and kalamkari skirts were another favorite of mine. They also have an enviable collection of the cutest, quirkiest home decor. When I move in to my own place, you can expect it to be a mini shrine to this store! Another favorite of mine is of course their jewelry – exquisitely handcrafted dokra necklaces and earrings that I could wear every day. 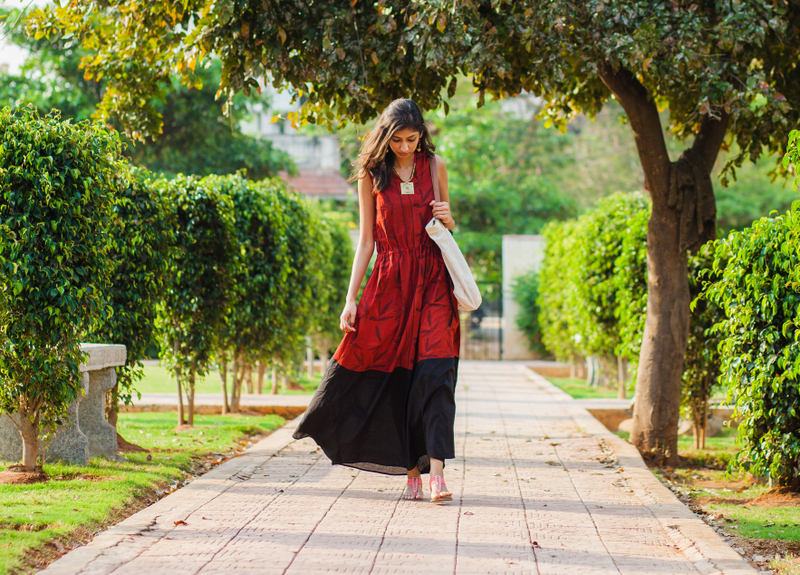 For my look I chose a comfortable and bright cotton maxi dress perfect for the weather here. Instead of going for the obvious choice of black accessories, I chose this pink Dokra necklace/earrings set which I think compliments this outfit perfectly.This had to be the laziest shoot ever (well for me!) where all I had to do was walk around, settle down on the grass with a good book, and prance around during the golden hour of sunset! 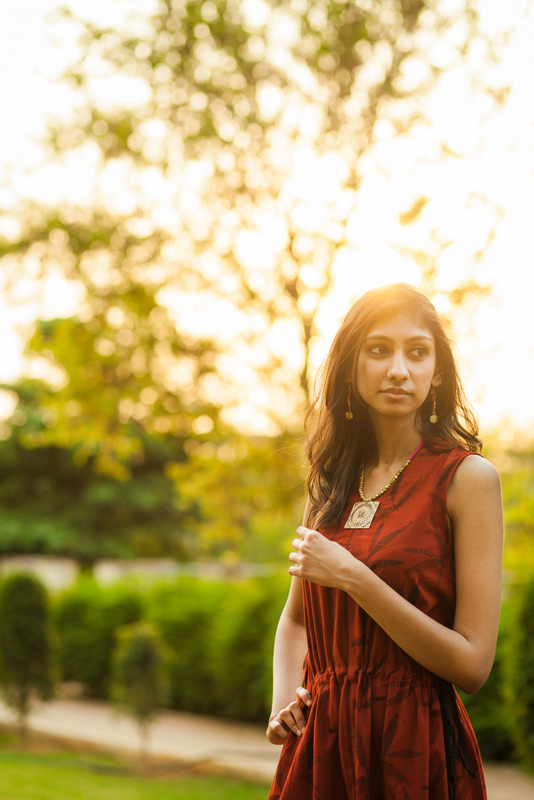 Beautiful pictures…love the soft touch of ethnicity to the look and the necklace is stunning! i couldnt find the dress you are wearing. 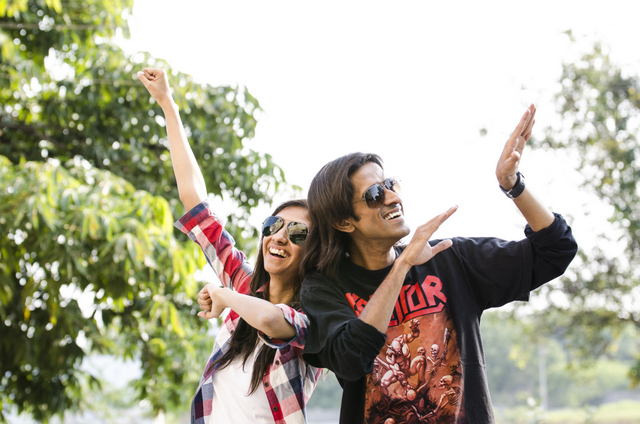 But a nice shoot…you are rocking the look! Soo nice! You look pretty. 🙂 The neckpiece is really beautiful. Such a nice location! Almost made me look forward to Summer! Looking pretty… Love your necklace, sandal and outfit.